It’s no secret that visitor overcrowding and the effects of mass tourism have lead to outcry that popular destinations are losing their authenticity and the much-needed support of locals. Longstanding grievances at ‘invasions’ of visitors escalated this summer across popular European cities into angry protests, searing public graffiti, and even violent confrontations. Resident backlash has been particularly dramatic in highly popular locations such as Barcelona and Venice, yet the phenomenal growth of mass tourism when left unchecked is negatively impacting travel destinations and in turn travel experiences across the globe. Boutique towns and internationally renown cities are feeling the strain, but so too are ‘Instagrammable’ natural wonders and wilderness areas like Yellowstone National Park, fragile Icelandic ecosystems, and previously pristine Thai beaches. It’s clear the plethora of pain points that arise for destinations, visitors, and residents when tourism is mismanaged are not going away. Far from being contained to a quickly forgotten news cycle, these situations simmer and flare while posing a direct business risk to tourist destinations that is ultimately preventable. Under pressure, many organizations fall back into shortsighted strategies that lock them into patterns of reactivity rather than effective flexible change management. For key destinations most strongly associated with resident backlash and overcrowding, it’s important to be reminded of the staggering scale of these visitation increases. Note the emotional use of language throughout the articles and examples we’ve compiled here and that you’re sure to come across yourself. Floods, swarms, ruined, trampled etc: the impacts compound and are felt in spaces and communities every day. The three examples below are just the tip of the iceberg, the global scale of the issue continues with a running list of headlines at the end of this article. Visitors rose from 1.7 million in 1990 to more than 7.4 million in 2012. In 2016 the city’s 1.6 million residents were heavily outnumbered by an estimated 32 million visitors, about half of them day-trippers. Quality of life for residents has decreased: rent hikes and affordability issues as infrastructure gets devoted to tourist market, no tourist-free zones to be found, sentiment that beloved neighborhoods and communities have been turned into tacky theme parks, high-profile protests. Cruise ship effect: 30,000 cruise ship passengers tramping through the small, ancient city per day during peak season. Tourist numbers outstrip the steadily declining resident population of 55,000. In danger of losing its World Heritage listing due to run down historic sites and environmental damage caused by cruise ships. In 2016 an area with 4,000 residents now sees 2.4 million tourists per year. Derided in media as being ‘spoiled’ and ‘ruined’. Legislation: tourist tax and law to limit tourist accommodation. Votes to limit cruise ship numbers and presence. Introducing crowd counters for high traffic areas. Tourist quota and increased ticket prices. Ticketing system or traffic light system to stagger along the trail. Aims to reduce visitation from 2.5 – 1.5 million a year. While measures to mitigate overcrowding are being proposed, the implementation and effectiveness of these tactics often leave lots to be desired as industry and government sectors struggle to agree. Frustrations and grievances continue to arise as residents question if the core issues are truly being addressed in a sustainable way. What can destinations do about it? To deal with this challenge, tourism planning must account for social and environmental impacts of tourism, as well as the economic benefits. Most DMOs (Destination Marketing Organizations) start by trying to help residents understand the value of tourism. While this is important, it’s not enough. By the time this need is identified, it’s often the canary in the coal mine alerting to a much bigger challenge. Instead of targeting volume of arrivals or hotel nights, destinations should strive to attract what we call ‘the right visitor.’ The right visitor adds value to the local community, doesn’t cause a negative environmental impact, and delivers maximum economic benefit. Redefine what success looks like (beyond economic measures) and create a collective vision for your destination’s future that includes the entire community’s interests. 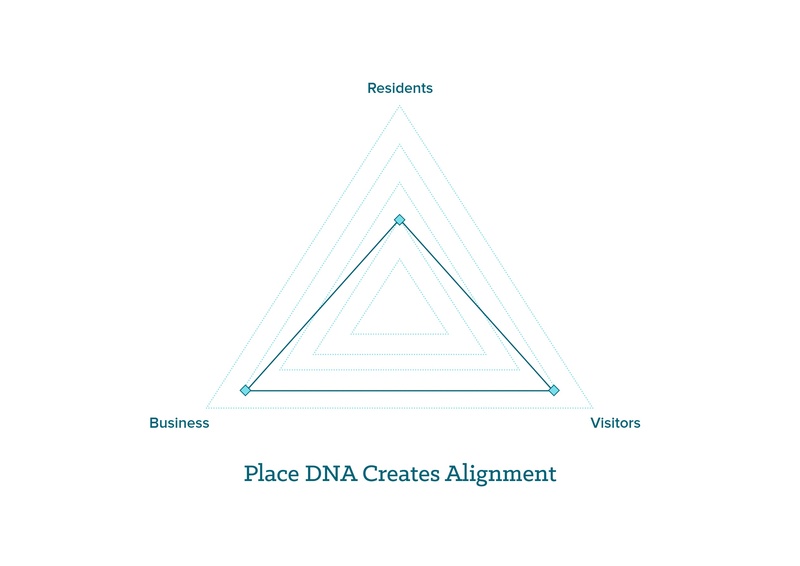 Uncover your Place DNA to understand who you really are, as defined by your residents in order to create right alignment between your community and visitor. This will provide a north star for policy decisions. Ensure that your long-term destination management plan goes beyond economic value to look at additional ways that tourism can enhance a destination. Ensure that the DMO has a mandate for destination management and takes a leadership role in managing the end-to-end visitor experience. We’ve helped destinations all over the world to plan for the future. In our experience, deep community collaboration and stakeholder engagement during planning are vital to ensuring success. Most DMOs think this is a problem that won’t affect them. That this only needs to be a consideration for famous cities and tourism hot spots and isn’t real until it’s in their own backyard. This is simply not true. Planning a destination with consideration for its residents is vital to the development of sustainable tourism. Our slide share “Destination Planning for the Future: Where to Begin” is a great resource to start addressing this in your own organization. As tourism grows unmanaged, we are keeping tabs. Here’s our running list of the impacts of unmanaged tourism growth that we’ll be updating periodically. We welcome your contributions, observations, and insights and will be following them closely in the comments. Time to get serious about over tourism? In the meantime, some Lisbon locals are taking matters into their own hands in creative ways to reconnect visitors to place. « Destination planning for the future: where to begin? 1. Where do ‘the wrong tourists’ go? Or must they stay at home? 2. How does the right visitor add value to the local community in a city trip, with the exception of doing so economically? 3. All long haul travellers who fly or come on a cruise ship or in a touring car have. in varying degrees, a negative environmental impact. Should they too stay at home? 4. What percentage of (potential) visitors do DMO’s reach before they arrive in a destination? The fiqures I have seen are (far) below 20%. The most (potential) travellers are influenced by word of mouth from friends, family, colleagues, etc., or through the media on which DMO’s only have a very limited influence/control. I am interested in your response to these 4 points. Thanks for your comment and questions Stephen. This topic is rapidly floating to the top of conversation anywhere including many places that want to stay ahead of potential challenges. We are in business because we believe in what is written on the walls of the University of Berlin: “The most dangerous worldview is the worldview of those who have not viewed the world.” (Alexander von Humboldt). For us, believing in the dynamics of travel is to not give up on humankind. On a fundamental level, we agree with Anna Pollock who advocates that a systemic shift is needed and that this shift probably goes beyond the boundaries of tourism. When working within the system, we take inspiration from Jane Jacobs’ bottom-up approach and Jeremy Rifkin’s win-win-win strategies. Based on their thinking, the point is that the residents should decide the answer to many of the questions you ask. They are often overlooked even though they are actually the heart and soul of a place. The number and type of visitors should be a decision by the community itself. Anna Pollock calls it your social licence to operate. This licence is dependent on a variety of factors and will be different from place to place, as defined by the community itself. One of the factors DMOs can impact directly is using our concept of the right visitor. The right visitor will expand your social licence to operate. Visitors can add value to the quality of life in many ways. They can have something in common with the people who live there. They can bring diversity and different perspectives or exchange of ideas. They can decide to move to a place, study there, or open a business. They can increase the reputation of local brands. They can be a reason for environmental protection. They can be the reason for infrastructure and amenities residents enjoy. Also, they can bring intellectual, social, economic or – even more important – what Pierre Bourdieu calls ‘symbolic’ value. The wrong visitor for one place can be the right visitor for another. By attracting the right visitor, they will attract more visitors like them through word-of-mouth. While a DMO might not have as much control over the message as they think or like, they should and can lead experience delivery by creating the right destination experience that the right visitor will enjoy, and the wrong visitor won’t. For most DMOs, this requires a shift in strategy. For most places, it’s an opportunity and necessity to get ahead of potential challenges down the road. For others who are dealing with real impacts right now, it is extra challenging because it’s like fixing a leaking boat in the middle of the ocean. We are aware that there is no silver bullet but there are different tools available, and we help places to use them, based on each unique situation. Thank you William for your reply. I do, however, not feel that you have answered my questions. I am a great fan of Anna Pollock, but is it possible to make a ‘systemic shift’ in small steps with a tsunami on our heals, which is what you seem to propose? As an architect I too am a great fan of Jane Jacobs, however, what in today’s system, certainly in Europe, is the community on a city level? Who is the community and where in Europe do the politicians actually consult and involve the community in their decision making? You write: ‘The number and type of visitors should be a decision by the community itself. Anna Pollock calls it your social licence to operate. This licence is dependent on a variety of factors and will be different from place to place, as defined by the community itself. One of the factors DMOs can impact directly is using our concept of the right visitor. The right visitor will expand your social licence to operate.’ ….. ‘The community’ no longer exists and certainly not in cities of millions, let alone tens of millions. And if the community no longer exists in an increasingly individualistic society, who is going to decide who ‘the right visitor’ is? What I am trying to say, your view is very optimistic and positive, but it seems to deny the urgency and enormity of the problem. In the words of Anthony Rowley,’It can be a mistake to assume that if something is a “good thing” then more of the same must be even better….’. And we need to do something about this. And if we don’t we will destroy that which is of value. Or in the words of Hans Magnus Enzensberger, “The tourist destroys what he seeks by finding it.” So radical situations require radical measures and that means addressing not only the good, but also the bad. Lisbon is so packed with turists these days that I wonder whether they really enjoy visiting the city.